I have a weird amount of respect for the Worms franchise because not only has it lasted for almost two decades, it has consistently been a solid, albeit unchanging experience. The problem is, I’ve never actually been able to really get into the games, but with Team17’s Worms Crazy Golf [$2.99 / HD], it’s the first new experience that takes the oddness of the franchise and converts it into something a little easier to pick up and play. If you’ve ever played any of the Worms games dating back to the Amiga, you should have a good idea of what to expect with a golf game. The difference is that you’re only controlling one worm instead of a battalion and your goal isn’t to crush the opposing team, it’s to hit a ball into a hole. The same control scheme from other Worms iOS ports comes into play here, you can slide your finger around for a better view of the course and you’ll move a small aiming reticle to line up the trajectory of your shot. You’ll hold a button to set the strength and whack it as far and accurately as you can. Perhaps you’ve already been clued in by the “crazy" in the title, but just so we’re all on the same page, this isn’t a set of normal golf courses. They’re essentially tricked out, massive mini-golf style puzzles, with exploding sheep, suicidal worms, cannons, magnets and more. Worms Crazy Golf has a ton of content too, with three 18-hole courses to play through, along with special challenge rounds. iPad users also get an additional 18-hole course, which is a nice added bonus to come with the extra cost of the HD version. There’s also a hot-seat multiplayer component where you can pass the game between friends. This is where it really excels, as it’s more entertaining to try and screw up the course for the person taking a turn after you than it is to get the ball in the hole. You’ll get to upgrade your clubs and other options through an in-game currency system. Each course has a few different goals to it — you can either play it like a real golf game where you need to get the ball into the hole at or under par, or you can whack the ball around collecting as many coins as possible. The game seems to keep track of everything you can think of for scoring, but other than a leaderboard, your score on each course doesn’t seem to matter much. For casual players, the golf club purchases and other upgrades are going to be confusing and hardly worth the trouble, but thankfully you can jam through the game without worrying much about it. The interface is a bit troublesome as well. You’ll need to double-tap certain selections to choose them, which makes for an awkward experience as you learn the ropes just to get a game started. One of my biggest problems with the Worms franchise as a whole is that they’re often slow affairs. While obviously a turn-based game is going to be a bit slow moving, it always seems like everything takes a little too long. Worms Crazy Golf is no different. 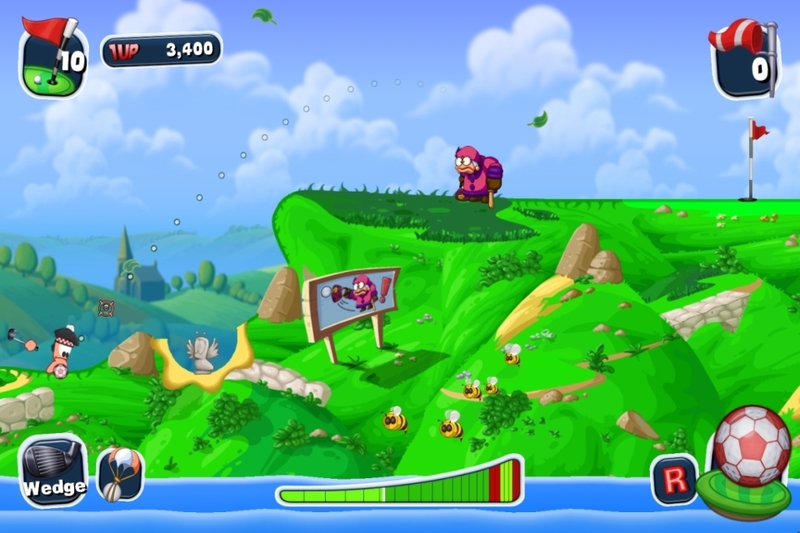 Your worm moves across the course to its next shot a little slowly, the ball’s physics seem to drag on a little too long and the fact you can’t simply reset a course if you screw up, means you have to play through even though you won’t make par. It’s not game killing, but it makes it hard to really engage with the eccentric play style of the game as whole. For a game that’s all about experimentation with the ridiculous environmental factors, it feels like it should get you hitting the ball as fast as it can. You’re also punished by not making par and you have to replay the level, which discourages playing around inside of the puzzle-like layout of each of the courses. In the end, it’s a Worms game with a singular objective. The course design changes enough that you’ll likely never get bored and the puzzling aspects make for an entertaining experience — it’s just too bad the golf part of it seems to be getting in the way of what has always made Worms interesting — screwing around and aimlessly taking the chaotic approach.